My fixer-upper forays with Bruce and other local realtors evolved when Susan joined the search. She shared my dream of an old farmhouse surrounded by open meadows with views and sunlight. She liked barns and was even receptive to my occasional flights of fancy about converting an old barn into a home. But our notions of size and simplicity were less aligned. And Susan was particularly keen on finding a Lake Champlain waterfront property. “What’s the point of having a place that’s not on the lake?” she asked repeatedly as if the answer were self evident. The odds of finding an old farm on Lake Champlain were slim enough, but the prospect of finding a simple, inexpensive property on the lake was totally implausible unless we shifted our thinking toward seasonal camps. South of Westport and north of Essex there were many small properties tucked along the lakeshore that Bruce insisted on showing us despite repeatedly explaining that they were not what we had in mind. We enjoyed looking and brainstorming, but we were growing frustrated with the increasingly diffuse range of properties we were seeing. We had lost our focus. Bruce was trying to show us all of the options available which in equal turns dilated and frustrated our search. But there was an even more fundamental problem: Susan and my interests were not perfectly in sync. Although a farm on the lake was proving an impossible ambition, our imaginations were piqued on several occasions by totally dissimilar and totally unlikely properties. An old “Great Camps” style summer house in Westport overlooking Lake Champlain’s Northwest Bay intrigued me until I realized that this pedigreed manse adjoined the town’s sewage treatment plant. A slate roofed barn, still square after a century or more standing at the crest of an immense field just south of Westport, also kidnapped my daydreams for a few days. I imagined a lofty open plan; exposed, rough hewn beams; magnificent views in all directions. But the seller was unable or unwilling to subdivide the field and barn from a much larger farm which included additional fields, an immense dairy barn, various other building for hay and equipment storage, a “pond” for storing cow manure and a large square farmhouse with cupola. And then there was Rosslyn, a Merchant-Ivory film set for The Great Gatsby’s Adirondack prequel. A century earlier. Located on the lake in Essex, it included a boathouse I’d loved since I was a child, a carriage barn, an ice house, and plenty of stone walls. But there were no fields and too many buildings. And the house was too big. And too run down. Way too run down. And the price tag was beyond unrealistic. During our first visit Susan and I had both known immediately, instinctively, conclusively that it was not for us. Purchasing this once stately but now desperately dilapidated property was a bad idea. A really, really bad idea. The expense alone. There was no conceivable short term return on investment. None. And the amount of time it’d take to understand all of the property’s problems, let alone begin to fix them, to build her back to her former glory? It was incomprehensible. But money, scope, logistics, that was just the tip of the iceberg. Long deferred maintenance, decades overdue; a gutted rear wing with failing floors suspended from cables that stretched through the middle of rooms; crumbling foundations; faulty electric, plumbing and heating; a boathouse that was one ice flow away from a watery grave; an ice house with corn cribbing walls and a collapsed roof. The current owner had dedicated the better part of four decades of his life, four decades — full time — to renovating Rosslyn and yet it was disintegrating around him. Buying Rosslyn was totally incompatible with our means, our lives and our plans. And yet Rosslyn seduced us. Susan and I visited and then, months later, revisited the property, each time musing about its potential despite knowing that we shouldn’t, couldn’t, wouldn’t ever own it. Our increasingly unfocused search — Susan and my notions of the perfect fixer-upper diverging and converging unpredictably — must have vexed Bruce despite his perennial good humor and patience. Though we did periodically visit properties when Bruce called with new listings that he thought might appeal to us, our enthusiasm gradually waned. Much of the North Country is still recovering from the devastation wrought by Hurricane/Tropical Storm Irene. Four weeks on, I return to the notes I jotted during and shortly after Irene passed through Essex, New York. A sheet of water cascades in front of the parlor windows. I’ve sunk into an armchair to watch the white caps rolling into our stone seawall. Into the dock beneath Rosslyn boathouse. Wind surges, thrashing and straining the leafy limbs of the gnarled old maple tree on the front lawn, violently snapping the boathouse flag. Hurricane Irene has been delivering a less devastating blow to the Northeast than originally anticipated, and yet our lawn is littered with branches, entire tree limbs and even the top half of an Aspen which snapped off next to the carriage barn. Lake Champlain‘s water level has risen dramatically, gobbling up the sand beach and lapping at the stone seawalls currently being rebuilt north of our boat dock. I initiated this post during the worst of Irene’s wind and water, however I quickly abbreviated my commentary. My mind flashed back to Lake Champlain’s destructive spring flood. I grew superstitious, my premature relief that Irene had taken it easy on us replaced by dread that I was underestimating her impact. The day started well enough. Clearing skies. Sunshine. Only a light breeze, virtually imperceptible after yesterday’s 65mph gusts. I checked the waterfront, noted the dramatic rise in water level then celebrated the absence of damage to the boat house. I walked the lawn and counted about a dozen broken limbs strewn over the grass. The top third of an aspen tree had snapped off and lay crushed to the south of the carriage barn. But no serious, unrecoverable damage. My sunny disposition clouded briefly upon finding 27 bags of ready-mix concrete that had been left uncovered by the fellow rebuilding the stone seawall. All had been soaked and were now petrified, unusable. Nevertheless, I departed for Plattsburgh relieved that we’d escaped virtually unharmed. This is where my notes end. The day would force me to recalculate my earlier conclusions. Yes, Susan and I had been fortunate. Rosslyn had been virtually unscathed by Irene. But many of our neighbors in Whallonsburg, Willsboro and Wadhams and throughout the Champlain Valley were underwater. Normally I’d drive through Willsboro, up and over Willsboro Mountain and then pick up “The Northway” (NYS Route 87) north to Plattsburgh. But I’d already heard that roads were closed beyond Willsboro, so I turned south toward the ferry dock to try another route. Our Town Supervisor was directing traffic at a road block, so I stopped and rolled down my window. “Would you show those folks how to get to Meadowmount?” she asked, pointing at a car with out-of-state tags that was parked across from the Masonic Hall. I pulled in front of the car and parked. I introduced myself to the driver and explained that they could follow me to Meadowmount. They were grateful. With 20/20 hindsight I should have realized that I would need to take Route 12 to the Lewis exit on the Northway and then cross over and lead them into Meadowmount from Betty Beavers Truck Stop. But there are a half dozen local routes between Essex and Lewis that would be quicker. It never occurred to me that all of them could be flooded. They were. And over the next thirty minutes I tried every one only to be stopped at road blocks or unmarked, submerged roads. Staggering. 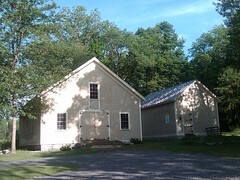 But most heart breaking of all was Whallonsburg, a hamlet of Essex a couple of miles inland from Lake Champlain. The Boquet River flows directly through the middle of Whallonsburg and it had flooded so high that five or six houses along the river were totally inundated. A couple of homes had water up the the second story windows! Emergency services had been set up at The Whallonsburg Grange, and volunteers were directing traffic and assisting displaced residents. I would revisit this heartbreaking scene the following day during a bicycle ride assessing the damage all along the Boquet River corridor. By then the water had retreated and residents were dragging furniture and carpets and clothing and books and appliances out onto their yards. Over the next couple of days enormous dumpsters were filled with the destroyed possessions. During my most recent conversation with a friend who lives in Whallonsburg I learned that at least one and maybe more of the homes were condemned. Despite the devastation, it’s been heartening to experience the community spirit and volunteerism that have resulted. The community has pulled together to help the residents effected by Irene with a fundraiser (Good Night, Irene) and countless hours of volunteerism. Still trying to absorb the depressing situation in Whallonsburg I proceeded to attempt one road after another. And it seemed that with each “dead end” our entourage collected another vehicle. In due course our entire caravan made it out to The Northway, hopefully in time for one of the cars to make it to the airport without missing their flight. At Betty Beavers I got out and explained to the first car how to get to Meadowmount and offered them my card in case they got stuck. Only a few days later I received a gracious email from them explaining that they made it safely to the music school where their son had studied some years prior. I mention this detail for the same reason I explained the community recovery efforts in Whallonsburg. Irene’s proverbial silver lining may be the humanizing influence. People connecting and helping one another. This was also the case last spring when Lake Champlain flooded its banks for weeks on end. In both natural disasters the disruption and destruction were catastrophic, but in both cases effected communities rallied and supported one another. This civic responsibility, this community spirit underpins the attractive North Country lifestyle that has embraced us since moving from New York City to Essex in 2006. In closing, the photograph at the top of this post was taken after Lake Champlain’s water level rapidly rose due to the runoff from Irene. Although it pales in comparison to the water levels last spring, it was surreal to watch our beach disappear as water levels returned to typical spring levels. What happens when a storyteller writes a book? When a talker becomes a typer? When the audience’s laughter, sighs, snoring, heckling and applause vanish? When margins and page count provide only the most porous parameters? For the past year I’ve been writing and revising a memoir about the four years that Susan and I spent renovating the W.D. Ross property in Essex. I’ve discovered that building a book is a bit like rebuilding an old house. No matter how great the bones, how stunning the view, how well preserved the architecture and design, and no matter how clear and enticing the goal, you can’t do it by yourself. In the case of our home it took the world’s most intelligent, beautiful and stubborn wife plus a vast community of contractors, carpenters, advisors, family and friends to rebuild Rosslyn. In the case of my book it will take your laughter, your sighs, your heckling (and even your prodding and booing and advising) to build Rosslyn Redux. Please join me at 8:00pm on Wednesday, August 3 at The Depot Theatre in Westport for a solo performance of Redacting Rosslyn, an evening of readings, storytelling and vignettes ranging from a wader-wearing Amazon named Rosslyn to a perennially pickled bathtub yachtsman. I’ll poke fun at the idiosyncrasies (and absurdities) of renovation, marriage and North Country life while plunging you into the creative process. Are you ready to help build a book? Thank you. I hope to see you! For Sale: Hyde Gate (aka Rosslyn), in Essex, New York, April 1910. Rosslyn artifacts pop up all over the place! And they’re not always Rosslyn artifacts; sometimes they’re Hyde Gate artifacts or Sherwood Inn artifacts… Honestly one of the most enjoyable aspects of owning and renovating our home is stumbling across interesting relics of its almost 200 year history. I originally came across the advertisement above on eBay. The auction item was a full page ripped from the April 1910 edition of Country Life in America. How could I resist? One more quirky artifact for the digital library! For Sale: Hyde Gate (aka Rosslyn) in Essex, New York, March 1910. The country residence of Caleb James Coatsworth Esq. is just at the outskirts of Essex Village on Lake Champlain, New York. The house faces the lake, and the grounds run right down to the lake with bath houses and a large private dock. The house is between eighty five and a hundred years old. Is built of brick. It is very beautifully furnished with the real antique Colonial furniture and although lighted throughout with electricity there is not on modem electrical fixture on the first floor. In the hall there is an old lantern, and in all the rooms old candelabra hanging from the ceilings; there are also lamps on the centre table lighted by electricity. The house is a beautiful example of the Colonial period. It contains ten bed rooms and two bath rooms on the second floor, and three bed rooms on the third floor, also two lavatories on first floor. One can leave “Hyde Gate” in an automobile after breakfast and lunch at Lake Placid, or leave “Hyde Gate” in the morning and dine at Bretton Woods in the White Mountains, or dine at Montreal, Canada. Lake Placid is fifty miles from “Hyde Gate” by road; Bretton Woods one hundred and eighteen miles; and the Windsor Hotel, Montreal, Canada is just one hundred miles; all the roads are very good. It Is a great central starting point for automobiling. The owner of “Hyde Gate” has made all of these trips. You can leave the dock at “Hyde Gate” in a launch and go to Westport, NY, or Vergennes, Vermont (the oldest city in Vermont) through the beautiful Otter Creek or Burlington, Vermont in less than an hour, or “Bluff Point” in two hours where the Lake Champlain Hotel is located, which is considered the best hotel In the Adirondacks. The grounds contain between five and six acres, beautifully laid out, and there is a great abundance of flowers, a large kitchen garden, and quite a number of fruit trees and currant bushes, etc. A stable with room for five horses, carriage room for five or six carriages, large harness room with glass case for harness, and good comfortable quarters for coachman. There is a large carriage shed outside of table where extra carriages can be stored, also suitable for two automobiles, several chicken houses, and a pigeon house. There is a large new ice house with a cold storage house built in connection with it. “Hyde Gate” is just half way on Lake Champlain, and one can make the trip to New York in a motor boat in two days running spending the night at Albany, or you can run to Montreal with a motor boat in two days. A couple of years later a similar advertisement ran in the April 1912 issue of Country Life in America. And it would seem that Caleb James Coatsworth was learning a thing or two about advertising with each return to ink. The text length and detail is generally the same throughout, but a bit of brevity slips into the equation, and the photographs improve significantly. Perhaps there are later advertisements that I’ve missed? For Sale: Hyde Gate (aka Rosslyn) in Essex, New York, March 1912. “Hyde Gate” is just at the outskirts of Essex Village on Lake Champlain, N.Y. It is the country residence of Caleb James Coatsworth. The house faces the lake, and the ground runs down to the lake. There are bath houses and a large private dock. The house is between 85 and 100 years old. It is a beautiful example of the Colonial period; made of brick. It is very beautifully furnished with antique colonial furniture. It contains ten bed rooms and two bath rooms on the second floor and three bed rooms on the third floor. Also two laboratories on the first floor. Two laboratories on the first floor? Fantastic! It’s handy having multiple versions of this ad to sort out the unlikely presence of a pair of labs in a summer residence… Two lavatories, now that makes a little bit more sense. Imagine the ten year old son who’s spent all spring looking forward to summer vacation on Lake Champlain. His father has promised that their summer rental includes two laboratories. Oh, the experiments that have occupied the boy’s daydreams in the final stretch of the school year. A homemade volcano, frog dissection,… the options are endless. And then to arrive after an exhausting journey along bumpy roads in the days long before air conditioning. And the lad races inside to search for the laboratories, to find the answer to his fantasies only to discover that it was an error. Two lavatories? What sort of evil joke is that? Remember the Lake Champlain flood? The good news is that flooding is abating. Rapidly. In fact the water’s “fallen” to normal spring flood stage… Which means that we’re finally catching up on the damaged waterfront, repairing the boathouse, installing docks and boat hoist, etc. You may remember that large ash tree was undermined by the flood and was beginning to topple down over top of the boathouse. Not good. You may also remember that local arborist Mark Sauslgiver decided to install a tension line from high in the tree to the guardrail north of the boathouse. The idea was that in the event the trees roots gave way and the tree toppled, the line would pull the falling tree northward, sparing the boat house. I liked the idea. Sounded good. Looked good when I drew a little diagram on paper. But, I’d be lying if I claimed that I was 100% confident it would work. That’s a big tree, and I had a difficult time imagining a static line enduring a fall much less staying taught and pulling thousands of pounds of gravity-fueled ash anywhere other than straight down. On top of the boathouse, the pier, and the railings. But, turns out Mark knew his tension lines. Today his crew removed the tree, piece by piece, sending massive chunks of wood down a “zip line” to the curb or New York State Route 22 where they could be cut up and/or chipped. The entire affair was a success! I’m deeply saddened to lose a mature, healthy tree that offered much appreciated shade in the heat of summer and served as a charming frame for images of the boathouse. But I am overjoyed that the tree was removed before gravity won. And I’ve been assured that sooner or later it would. I’ll add a short video soon! Last night’s moonrise over the Vermont foothills (south of the Green Mountains) was absolutely sensational! The moon started out fat and orange as it made a dramatic appearance. My bride and I first spied the “Great Pumpkin” while driving home to Essex from Willsboro after dining at Johnny’s Smokehouse. Breathtaking. And elusive because it kept disappearing behind the trees. Once we arrived home, I grabbed a camera and headed down to the waterfront where I tried to capture — albeit in blurry facsimile — the less orange and smaller but still exquisite orb shimmering across Lake Champlain. The view in this video was shot from the flood damaged but finally dry waterfront of our home in Essex, New York. You can see the Essex ferry dock where the Essex-Charlotte ferry delivers and picks up passengers, and the Old Dock Restaurant is even slightly visible beyond the illuminated ferry gallows. Rosslyn’s boathouse is silhouetted in the foreground with a Lake Champlain moon beam inviting you to begin enjoying summer after Lake Champlain floods put such a damper on the first half of June. As of this morning, the USGS website reports that the Lake Champlain water level has fallen to 100.33 feet. Most of the bottom terrace of the waterfront is now water free, except for where flooding damaged the stone retaining wall and eroded the lawn. This weekend we’ll remove the remaining debris and begin to repair the damage. We’re still waiting to hear what New York State has decided about stabilizing the embankment and repairing the road, so we’ll need to hold off on significant repairs in the area where NYS Route 22 (aka Essex Road or Lakeshore Road) collapsed at the end of May. But hopefully by next week we’ll be able to start windsurfing and possibly even install the boat lift and docks so that our ski boat can be launched. A late start to summer, but hard won! Edward Pais was a classmate of mine at Deerfield Academy from 1986 to 1990, and he now practices architecture in Burlington, Vermont. Despite being out of touch for more than two decades we recently reconnected via Facebook. Ed joined the Rosslyn Redux Facebook page and he’s offered ongoing feedback about our boathouse during the Lake Champlain flooding. Recently he offered to come over and take a look. Needless to say, I eagerly accepted his offer. We started out with a delicious lunch at Essex Provisions overlooking the still flooded marinas, then headed back to Rosslyn to take a look at the boathouse. Ed’s reaction was encouraging, and despite pushing him into engineering territory a couple of times, I mostly listened and took mental notes. He reminded me that he’s an architect and not an engineer, but repeatedly expressed his confidence in the work of Engineering Ventures in Burlington. Paul Hobbs who handled most of the structural engineering for the boathouse renovation repeatedly impressed with his keen mind, so Ed’s confidence was not misplaced. That said, I do intend to follow up with Hobbs and/or Jeffords Steel to ascertain whether or not the beams which support the suspended pier were fabricated out of COR-TEN or a similar weather resistant steel. Ed’s recommendation to quickly and aggressively treat the mold situation was highlighted in a follow-up message after his visit. He suggested that we should remove the baseboards to inspect for mold. He linked me to helpful information “Cleaning Mold on Wood” that confirms that we’ve been remediating the post-flood mold situation appropriately. The molds seen on lumber are largely a collection of fungal spores on the surface of the wood. Wet wiping and scrubbing the lumber will remove the mold. But simply wiping the wood can release spores into the surrounding air. A better approach is to gently spray or wet down the mold prior to removal. There are a number of products on the market, ranging from common bleach to commercial mildewcides, which are promoted for cleaning mold from wood. However, the U.S. Environmental Protection Agency suggests using a mild detergent and water for most mold clean up. The EPA recommends wet vacuuming the area, wiping or scrubbing the mold with detergent and water and, after drying, vacuuming with a high-efficiency particulate air (HEPA) vacuum. Huge thanks, Ed, for taking the time to coach me through the latest challenge! I really appreciate it. Rain, rain, rain. That was the main melody this spring, and all of that rain delayed planting vegetables. But as Lake Champlain‘s devastating flood of 2011 begins to subside, virtualDavis turns to the garden. The latest Rosslyn Redux video update takes a look at what’s been planted in the garden including lots of tomatoes: Beaverlodge 6808, Cherry Buzz, Cuore Di Bue, Green Zebra, Kellogg’s Breakfast, Sweet Seedless Hybrid, Fourth Of July, Tye-Dye Hybrid, Brandy Boy, Orange Wellington and Steak Sandwich. In addition to the organic and heirloom tomatoes, Rosslyn’s 2011 vegetable garden includes Casper Eggplant, Prosperosa Eggplant, Millionaire Hybrid Eggplant and Fairy Tale Organic Eggplant. On to the peppers: Felicity Pepper, Pizza Pepper, Créme Brulée Pepper; Ancho Magnifico Pepper, Ascent Pepper and California Wonder 300 Pepper. Then there are the melons: Fastbreak Cantaloupe, Petite Treat Watermelon and Ruby Watermelon. Last but not least there are Franklin Brussels Sprouts and Dimitri Hybrid Brussels Sprouts. What are you planting in your garden this summer? This afternoon Essex neighbor Stephen Phillips stopped by to help assess the damage to Rosslyn boathouse caused by week after week after week of flooding. Having run a large contracting company for many years, his perspective is valuable and his offer of assistance welcome. 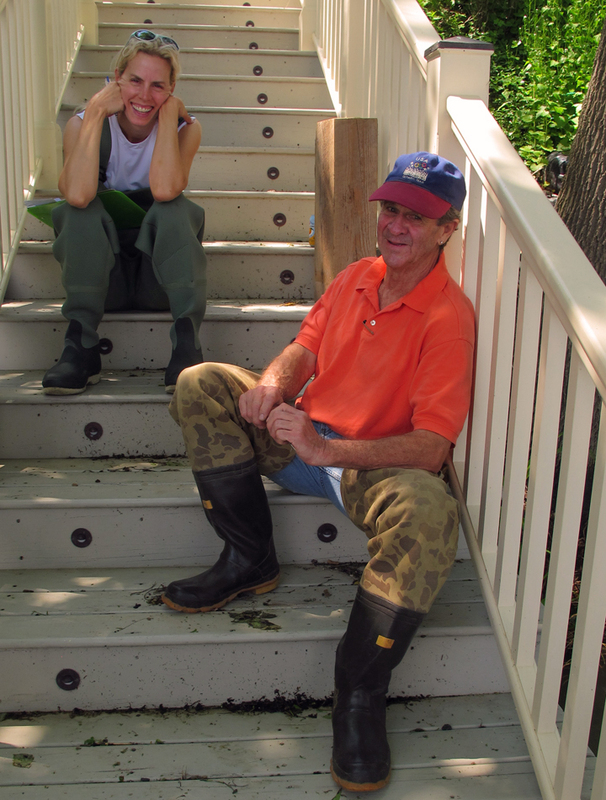 In this photo he’s sitting on the stairway down to the boathouse with my bride, waiting for me to don waders and trudge out to the partially submerged boathouse. He spent the better part of an hour examining the structure, asking questions and advising us on how to proceed. We took plenty of notes! The good news is that the structure remains sound, and damage so far has been minimal. Unfortunately we identified increasing surface mold, especially prevalent on fir bead board that must have received less oil sealer than neighboring planks. Most boards are okay, but several are covered in green, gray and black fuzzy mold! Beneath the water level inside and outside, everything is covered in slippery, green algae. We hope that this will be easy enough to remove with a pressure washer once the water retreats. At the very least we’ll need to re-seal and repaint all of the surfaces that have been saturated for the better part of two months. And until the water level falls another 18″ or so, we’ll need to continue monitoring the waterfront from large debris, trees, etc. Constant vigilance and quick log wrangling has saved the structure significant damage so far, but Steve was quick to remind us that even one of the large trees afloat in Lake Champlain combined with wind and wave action could devastate the boathouse. As if we needed the reminder! On the bright side, he explained in impressive detail what is happening with the collapsing road. Have I mentioned this previously? Perhaps only on the Rosslyn Redux Facebook Page… That image at the top of this post is a sketch and notes he prepared last Friday when he came by to speak with the New York State DOT engineers who were preparing to stabilize the badly eroding bank. Actually, it turned out that the erosion was far more severe than he could ascertain, completely eliminating most of the embankment and undermining the road. The pavement began to crack in deep fissures running parallel to the lake as the weight of the road cause it to settle and slough. The remedy involved 250 tons — approximately ten tandem dump truck loads — of riprap dumped over the side of the road to arrest further erosion and stabilize the road. I’ll share some video footage soon which reveals the current status of the waterfront and road including the riprap “armor”. The DOT is continuing to monitor the road to determine whether or not additional stabilization will be necessary. In the event that the road continues to settle, the next step will be to install a steel sheet pile retaining wall. Steve’s explanation for why this would be advantageous was convincing, but we are hoping against hope that it will not be necessary to mar this historic waterfront with a steel retaining wall. Steve offered to assist us in deciphering the potentially complex decisions ahead, and suggested that we should consider this an opportunity to permanently address the long term stability and safety of the waterfront. I appreciate his optimistic perspective, and my bride and I have sent out cosmic “Thank you!” vibes all afternoon. Thanks also are due another friend and Champlain Valley writer/editor/blogger, Kathryn Cramer (@KathrynC), who has been doing an outstanding job of documenting Lake Champlain’s aquatic antics over the last couple of months. Full stop. Kathryn Cramer has done an outstanding job of documenting Lake Champlain for the last couple of years! That goofy picture of yours truly standing inside the boathouse in the earlier days of the flood was taken during her first visit to our soggy waterfront. She’s been back at least once, and even helped pull some driftwood up from the lake. Kathryn’s support and understanding in recent weeks has been a big morale booster, and he exhaustive coverage of the 2011 Lake Champlain floods is simply unparalleled. I hope she’ll curate her many photos into an exhibition once we’ve all recovered from the damage. It would make for a fascinating chronicle! …and the sun sets on another day under… fingers and toes crossed for a hot sunny week!!! Ah, yes, another day under water, but optimism flowed easily after viewing her handsome image. In fact, unless you look closely at the lower left border (or recognize the submerged Old Dock Restaurant, visible in the distance), you might not even notice that the boathouse is flooded. A trick of the eye, but soon, I hope, the floorboards will be visible once again. And then we can set to work with pressure washer and paint brushes to restore her to her former glory. Thank you, Jill, for reminding us to smile, and for reminding us that being underwater (or not) is just a matter of cropping!